FEA Training Consultants Inc. offers a full line of SOLIDWORKS 3D CAD training courses to support all our users at every level. 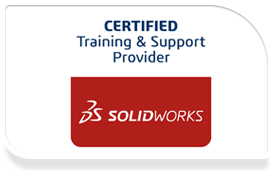 As an authorized SOLIDWORKS Training and support center, FEA Training Consultants Inc. is able to offer professional training of the SOLIDWORKS 3D CAD software and is taught by a team of award winning certified instructors. Our Toronto based training and support centre serves the Ontario area including offering SOLIDWORKS courses in London, and SOLIDWORKS training in Ottawa and Waterloo. Mark Polanski, Manager CAC Turbo Intercool Ltd. Learn to build parametric models of parts and assemblies, and how to make drawings of those parts and assemblies. SOLIDWORKS Electrical greatly simplifies 2D electrical schematic creation by providing an intuitive interface that gives you faster results.Bi-directional integration in real time with SOLIDWORKS 3D CAD provides better collaboration and productivity, resulting in fewer product delays, more consistent and standardized designs, lower costs, and faster time-to-market. This course teaches you how to maximize your use of the assembly modeling capabilities of SOLIDWORKS mechanical design automation software. Learn how to use multibody solids, sweeping and lofting features, and the more advanced shaping capabilites of SOLIDWORKS. Surface Modeling teaches you how to build freeform shapes using SOLIDWORKS mechanical design automation software. Learn how to build sheet metal parts, converting conventional parts to sheet metal including assembly context. Learn how to create welded structures with standard structural members. Teaches you how to manage files within SOLIDWORKS.It includes explanations of the SOLIDWORKS file structure, file references, file associativity, and how to manage a multi-user environment. Learn how to use the SOLIDWORKS API (Application Programming Interface) to automate and customize SOLIDWORKS.